Regarding weather, the best time to visit Egypt is from October to April, when temperatures are at their most pleasant. However, December and January constitute peak tourist season, and iconic sights like the Pyramids of Giza, the Temples of Luxor, and Abu Simbel can get uncomfortably crowded. Also, this is when rates at Red Sea resorts are at their most expensive. If minimizing expense is a priority, tours and accommodation are often significantly cheaper during the hot shoulder-season months of June and September. Realistically, temperatures in July and August make daytime sight-seeing difficult, although the country's coastal resorts offer some respite from the summer heat. For most people, the weather is the crucial factor in deciding when to visit Egypt. The climate is typically hot and sunny throughout the year, and there is very little precipitation south of Cairo. Even in the wettest places (Alexandria and Rafah), it only rains on an average of 46 days per year. Winters are generally mild, with daytime temperatures in Cairo averaging around 68 degrees Fahrenheit. At night, temperatures in the capital can drop to 50 degrees Fahrenheit or lower. In summer, temperatures reach an average of 95 degrees Fahrenheit, exacerbated by intense humidity. It is important to remember that many of Egypt's ancient sights are located in desert regions that remain hot despite the proximity of the Nile River. Climbing into an airless tomb on a 100-degree day can be draining, while several top attractions are located in southern Egypt, where it is even hotter than Cairo. If you're planning on visiting Luxor or Aswan from May to October, make sure to avoid the midday heat by planning your sight-seeing for the early morning or late afternoon. Between March and May, the khamsin wind brings thick dust and sandstorms. With this in mind, the best time to book a Nile cruise is between October and April. Temperatures are manageable at this time of year, allowing you to get the most out of day-trips to iconic sights like The Valley of the Kings and the Temples of Luxor. For the same reasons, travel during the peak summer months from June to August is not advised. Average highs for Aswan exceed 104 degrees Fahrenheit at this time of year, and there isn't a lot of shade to offer respite from the midday sun. June to September is an excellent time to visit the Red Sea beach resorts. Despite being the peak of summer, temperatures on the coast are much cooler than those of the country's interior. Average summer temperatures at popular beach resort Hurghada hover at around 84 degrees Fahrenheit, while the sea temperature is a balmy 80 degrees—perfect for snorkeling and scuba diving. In July and August, however, it's essential to book well in advance, as resorts can get busy with vacationing Europeans and Americans, and with wealthy Egyptians seeking to escape the heat of Cairo. Summers in the desert should be avoided, as temperatures at destinations like Siwa Oasis routinely exceed 104 degrees Fahrenheit. During the depths of winter, nighttime temperatures can plummet to just below freezing, so the best time to visit is halfway between the two in either spring or autumn. February to April and September to November are the optimum times temperature-wise, although spring visitors should be aware of possible sandstorms as a result of the annual khamsin wind. Ramadan is the Muslim holy month of fasting, and the dates change every year according to the dates of the Islamic calendar, but usually fall between the middle of May and the end of June. Tourists are not expected to fast when visiting Egypt during Ramadan. However, shops and banks tend to close for much of the day, while many cafés and restaurants do not open at all during daylight hours. At night, there is a generally festive atmosphere as eating and drinking resume. Toward the end of Ramadan, there are several festivities that are fun to experience and observe. Spring is a nice time to visit Egypt, as temperatures are typically quite moderate, but some visitors may want to avoid the "Khamsin wind" season that runs between March and April as it can carry sand and dust in the air. As a shoulder season, prices for hotels will be more reasonable than during winter. Abu El Haggag Moulid, a five-day carnival in Luxor, typically takes place in the spring, a month before Ramadan. The festival celebrates a 13th-century Sufi leader, Yusuf Abu Al Haggag. People of Egypt celebrate Shem al Nessim to welcome the season of spring in the country. It usually takes place during April, after Coptic Easter. Temperatures can often be sweltering during the summer, especially in Upper Egypt near Luxor. But traveling during this time has its perk: You can see Egypt without swells of fellow tourists, leaving you in peace at some of the country's most-revered monuments. Ramadan typically falls during the summer months; beware that some attractions may close earlier than usual. Muslims end the long month of Ramadan with Eid al Fitr, a religious festival. Like spring, fall brings cooler temperatures and affordable prices. Heat can sometimes last into October, but crowds are still thin, making this a great time to visit popular monuments. If you're planning a visit to the beach, this is a great time of year, as the Mediterranean Sea is still warm and uncrowded. Wafaa Al Nil is an ancient festival devoted to the Nile River. It's typically held during September. While winter can mean nice weather, it's also the high tourist season. Attractions will be more crowded, and hotel prices can skyrocket. There is occasional rain and some cities, like Alexandria, will be quite damp. On January 7, the Coptics of Egypt celebrate Coptic Christmas. At midnight, worshippers gather en mass and enjoy a traditional "fata" meal together. 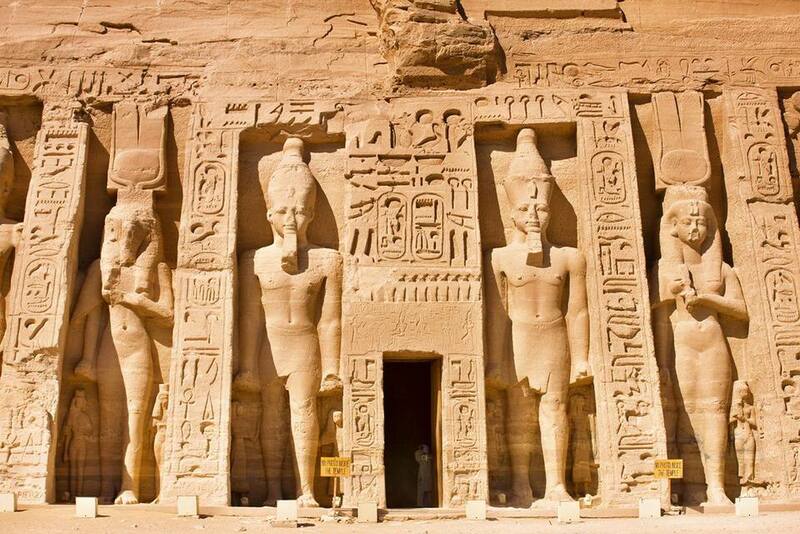 The Abu Simbel Festival is held on February 22 each year, celebrating the country's eponymous temple. Formerly held in the summer, Cairo Art Fair is one of the largest exhibitions of contemporary art in the country. The fair showcases the work of more than 100 of the country's top artists.